OpKey Plugins are utilities that involves in the test execution of corresponding application types. There are about 12 OpKey plugins so far for supported by OpKey. While installing a new OpKey Execution Agent, there are 4 plugins installed by default along the OpKey Execution Agent. They are OpKey IE-Plugin, Desktop Plugin, Web & Utility plugin. If you need additional supported plugins then you need to download them from the Plugin & Recorder links under Download Center on OpKey Web. Once the plugin has been download successfully, you can install it easily. Double click on the setup file to initiate installation. Click Next to proceed installation. Check I accept the terms of the License Agreement and click Next to proceed installation. Here, you can see that the OpKey OracleEBS Plugins is being installed in the C drive at specified location showing available, required and remaining storage space. 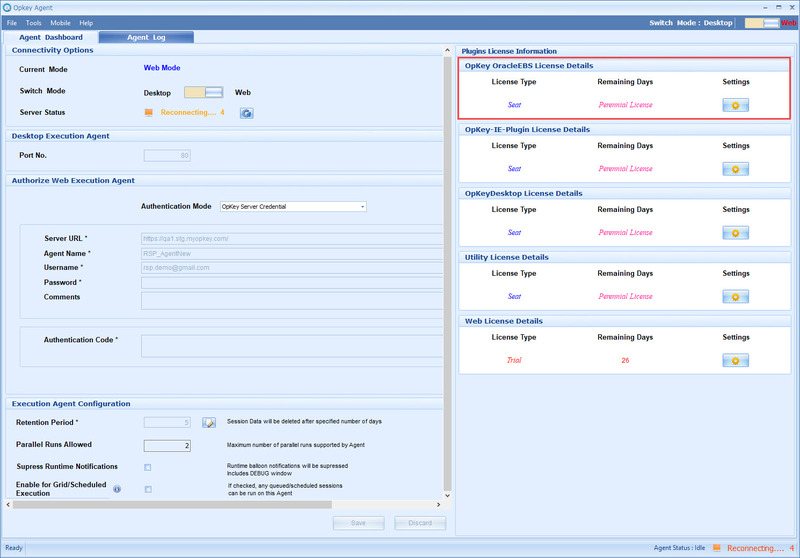 Here, you can apply usage settings of the OracleEBS Plugin. You can create installation logs by checking Create Installation logs checkbox. The installation process has finished. Click on Finish. If your OpKey Agent is open then relaunch it. Now you can see that the OpKey OracleEBS Plugin has been installed successfully.